Hatcho Miso is famous for the same reason that Okazaki is famous: Tokugawa Ieyasu, stone products, and fireworks. Hatcho Miso has a unique flavour which is made from high-quality soybeans, salt and water. Cooked and mashed soybeans are shaped into small balls and mixed with salty water. Then the Miso ferments for 3 winters. Hatcho Miso is made by the Hatcho Miso Company in Hatcho (Eighth street), to the west of Okazaki castle. The name Hatcho is taken from this location. In the Meiji era, Hatcho Miso became the daily choice of the Emperor of Japan. Hatcho Miso is less in water and salt content. It is easy to digest due to the aminolysis of the soy protein and is high in vitamins and minerals. Hatcho Miso is a natural food since neither food additives nor pasteurisation is used. Miso has yeast fungi which need carbohydrates, the right temperature and enzymes. Summer in the Tokai area(the middle part of Japan) is hot and the hot weather accelerates yeast fungi fermentation very quickly in kome (rice)-miso or mugi (barley)-miso. Thus Hatcho Miso developed mame (beans)-miso which contains less carbohydrates and tolerates the hot weather much better. 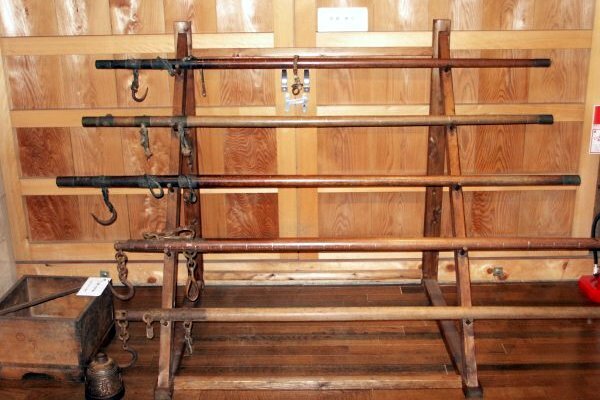 Hatcho Miso was Tokugawa Ieyasu's favourite and his armies were supplied with the miso because it can be stored for quite a while and can be portable due to its reduced water content. It also has been taken on Japanese expeditions to the South Pole. Hatcho is the place where Hatcho Miso originated and it is "hatcho= eight cho"(cho is an old unit of length used in Japan to measure distance: one cho is equal to 108 metres) away from Okazaki castle where Tokugawa Ieyasu, who founded the Edo feudal government, lived. The Hatcho is located on the banks of the Yahagi River, as it was easy to transport soybeans and sea salt there. Also Hatcho is the best place where high-quality springwater is easily accessible from the granitoid ground in Okazaki and is endowed with the right temperature and suitable humidity in order to make Hatcho Miso. Yahagi soybeans or Nanbu soybeans (Touhoku) and Aiba salt (Kira at the mouth of Yahagi River) were mainly used back then, however currently the ingredients are from all over the nation such as soybeans from Hokkaido and sea salt from Okinawa. Salt, lumber for miso vats (considered to be Yoshino cedar) and river stones for piling on miso were transported by ship. Half a shipful of salt was unloaded at this place and the rest was carried to Asuke at the upper reaches of the Yahagi River. The salt was transported on foot or by horse from there to Shiojiri along a road called "shio no michi (The road of salt)". Then the empty ship was loaded with a lot of river stones and brought them back to Hatcho. Thus the river stones used currently are from Asuke. It was paid for by miso as a replacement for money and the ship owner left acertain amount of miso for himself and sold the rest in Osaka or Edo. We come back to the Hatcho Miso. Savory Hatcho Miso was well appreciated by Tokugawa's armies due to its mobility and long storage resulted from less salt content. Hatcho Miso spread throughout Edo (now Tokyo) as Tokugawa moved the capital to Edo. 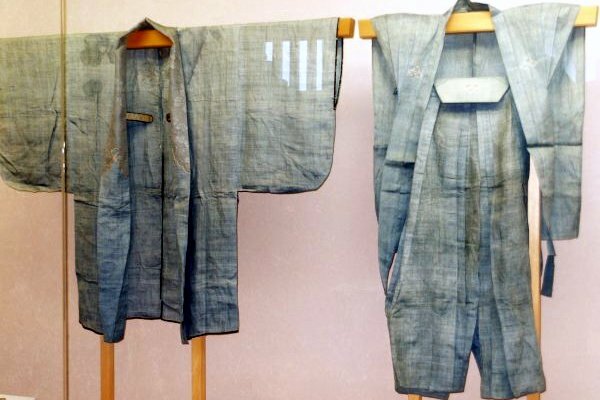 It also spread throughout the country due to feudal lords' Mandatory Alternate Residence System in Edo. Nevertheless Hatcho Miso currently holds only a10% share whereas kome-miso (rice miso) takes about 80%. The first biggest damage to Hatcho Miso was because of the Tokyo Earthquake in 1923. White kome-miso was brought from Nagano prefecture in relief supplies to help out victims. 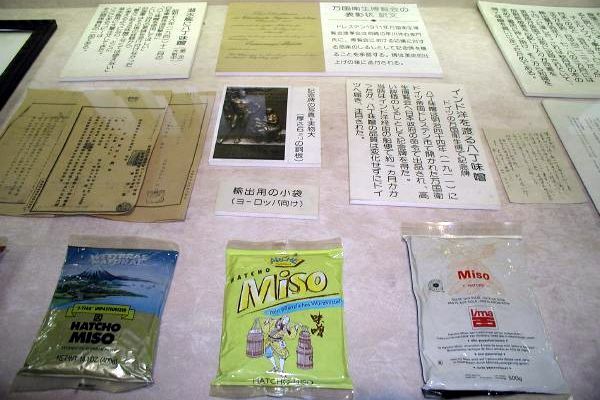 Furthermore, the Second World War made Hatcho Miso almost completely disappear by bringing kome-miso into the Kanto area as relief supplies. Although Hatcho Miso disappeared, it got the right to supply the Japanese royal family in 1892 and became the daily choice of the Emperor. Even though the system was abolished in 1954, Hatcho Miso is still the Emperor's favorite miso. Hatcho Miso spreads not just domestically but also internationally and is exported to 33 countries in the world. Hatcho Miso has less water content which makes it harder to go off, therefore tolerates lengthy transportation. Some countries have their own regulations on the ingredients hence it is necessary to make Hatcho Miso (including package) separately from the ones for domestic market. However along with the domestic market, white miso takes the majority and Hatcho Miso is not as popular as white miso yet. Everything was done by hand a long time ago. A hot-water kettle was used to generate steam for soy beans at that time. 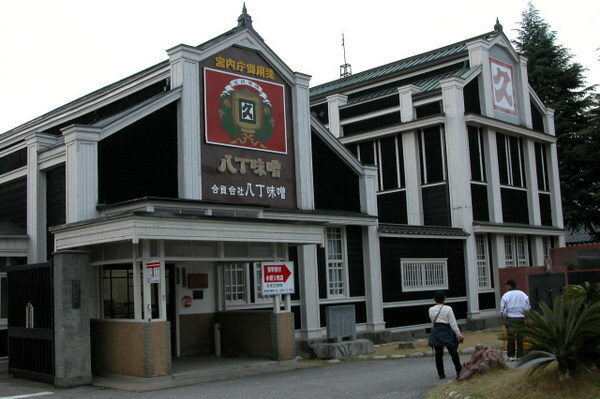 The kettles used by one of the Hatcho Miso companies were made by Hattori Kougyo K.K. (established in 1885). 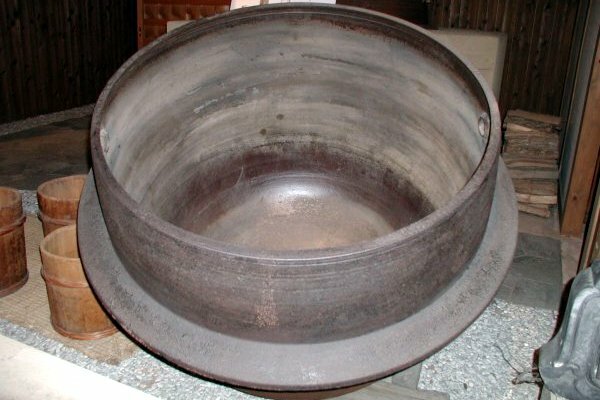 Some of the kettles have 1 or 2 holes of about 10 centimetres in diameter, called "yukuchi" or "yuguchi". Sake breweries and miso makers have steaming processes using a big kettle and a steamer,"seiro". A set of kettle and steamer is called "koshiki" (cupola furnace). Once a steamer is set on top of a big kettle, it is necessary to supply additional water without moving the steamer during the steaming process. The holes are specially designed for that reason. One hole is common but 2 holes are extremely rare. These holes are drilled after casting the kettle. Soy beans are steamed in the cupola furnance and shaped into fist-sized balls to be dusted with koji mould spores. The balls are then mixed with salty water in a basin called "hangiri". Then the miso is carried into a big cedar vat and beaten out. The depth and diameter of the vat are six "shaku" (shaku is a unit of length: one shaku is equal to about 30.3 centimetres). The staves are more than 10 centimetres thick. After putting 6 tonnes of miso in a vat, cover the top with a linen cloth and 15-20 of thin and long wooden boards are to be placed as a lid. On top of the wooden lid, pile on top a 3-tonne-pyramid of river stones. The stones weigh half of the miso and the vat is ready to be left for 3 years without moving the stones. The salt content in miso can be reduced by pressing. The masonry is the only process still done by hand. The pyramid like river stones are not merely piled up randomly. It is carefully-calculated not to collapse. The stones are piled up by making the outside higher and putting pressure on the centre. This structure operates similar to stone walls of old Japanese castles and can withstand earthquakes with a seismic intensity of 3 or 4. It requires 10 years of experience to pile up stones in a good shape. The stones used to be carried one at a time by hand throught a few people on a ladder though the stones are moved by forklift and piled up by 3-4 people in 30 minutes to 1 hour. Each of about the 150 stones weighs a maximum of 20 kilograms to be carried by one person. The reason why one big stone of 3 tonnes cannot be used is because there would be deviations to one side or the other. Theoretically water is an alternative but it is also a natural enemy of miso hence this cannot happen. Hatcho Miso can be made easily without quality management except for worrying about leaking roofs. Hatcho Miso is called ten nen jozo (naturally fermented food) because it is made in the course of nature. Mechanical methods which make miso ferment artificially has spread largely due to cutting-costs, however it has a plain flavour compared to naturally fermented miso. 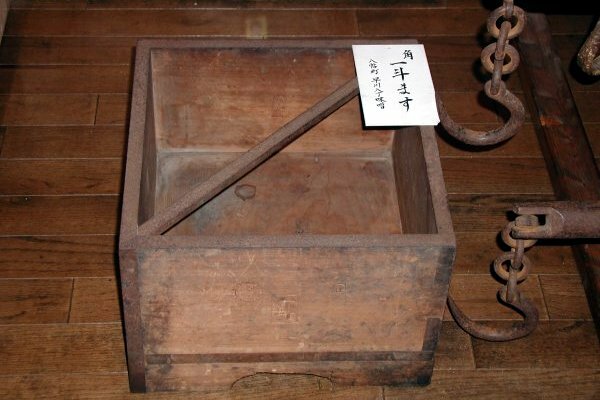 The old traditions have been maintained to make Hatcho Miso. Hatcho Miso ferments as much as the river stones are lifted a little bit as a result of summer heat and lowered by wintry chill. Hatcho Miso needs both summer and winter. The taste and flavour could be changed a little bit by a cold summer and a warm winter but the changes cannot be tasted by human beings. In recent years miso vats have been pedestaled to be moved by forklift. Until forklifts were introduced, vats were placed on the floor therefore the production process was carried on with a focus on the vats of more than 6 tonnes. Now a new process is carried on that focuses on miso. Nowadays almost all of the production process is done by machine though the miso vats used currently are about 100 years old. For your information, the container for miso is called oke (vat) not taru (cask). Oke is used as a container which has no lid and can get a lid on. On the other hand taru is a container with a lid. Beer keg has a lid and is called taru and bathtub does not have a lid, which is called furo (bath) -oke. 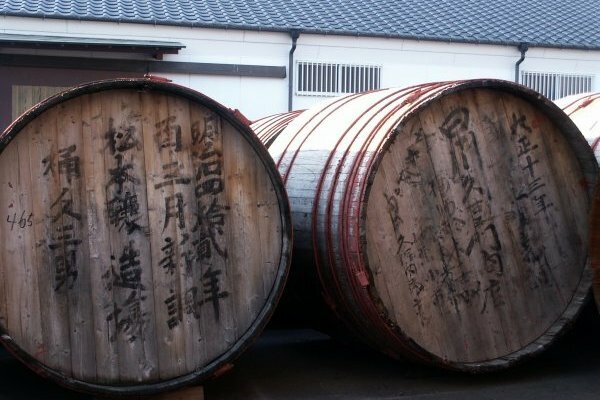 There are some small casks for miso called kesho daru in the market because the cask is made as a package of miso. At the back of the miso vat, there are some letters which indicate the name of person(s) who made it and the year it was made. There are some reasons why the 100-year-old vats are still used. The first one is due to the live microorganism called Aspergillus. This microorganism lives over centuries and creates a unique Hatcho Miso flavour. Vats are not washed until the next time miso is carried into it. If the vats are washed right after, they immediately dry and become loose. Thus miso sits a little bit on the surface of used vats. Another reason is the shortage of vats. About 50-60 vats are made at one time. 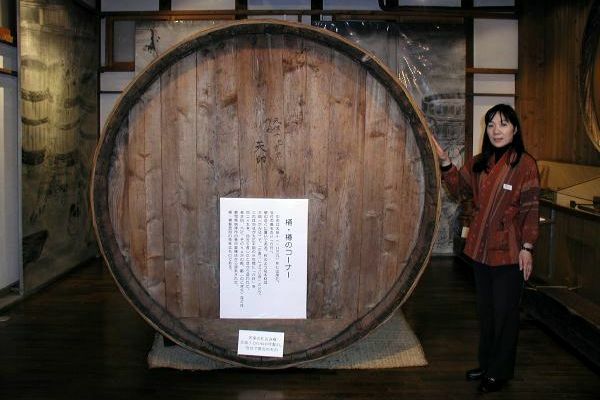 The newest vats were made in Taisho Period. This resulted from the aging of oke and taga (hoops of braided bamboo around oke) makers. These makers are very old and they do not have the physical strength to make such a huge oke and taga. At one of the Hatcho Miso companies, these makers have become the company staff these days. To make matters worse, Japanese cedar used as lumber for the miso vats has decresed. 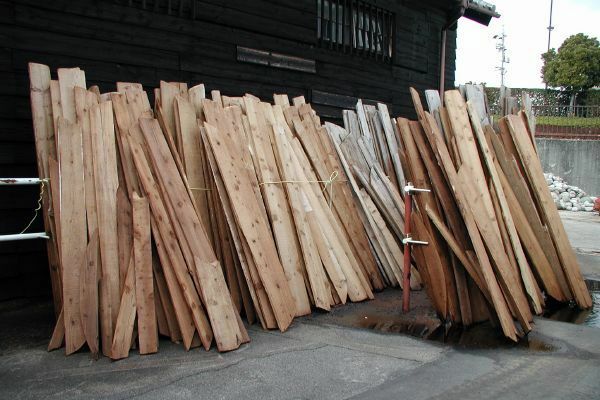 Japanese cedar or Japanese cypress are the most suitable lumber for miso vats but cedar is mainly used since Japanese cypress is more valuable and harder to manufacture. Alternative materials such as stainless steel or FRP (Fibre Reinforced Plastic) are under investigation. 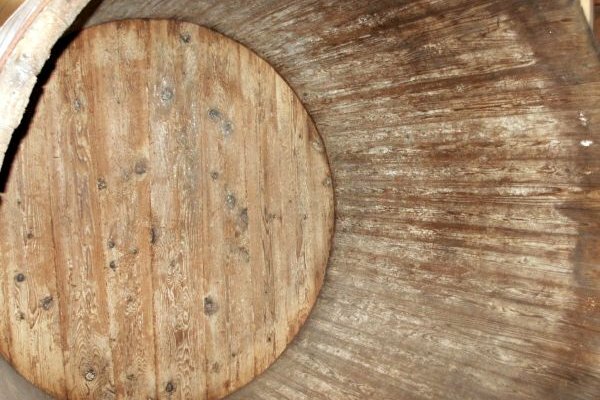 However there are concerns about changes of flavour between cedar vats and stainless steel or FRP vats. 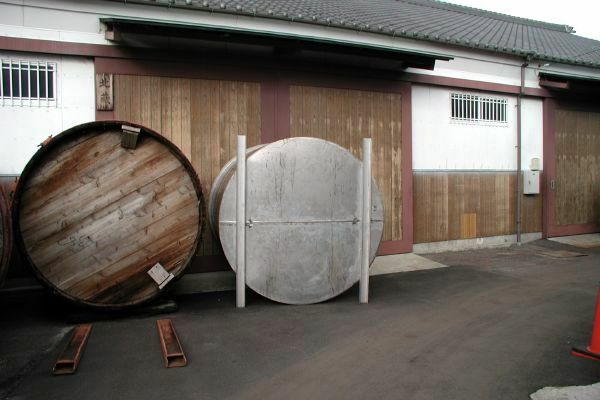 Another choice is to buy used vats from Japanese sake brewing at cheaper prices since they use similar vats. On the other hand, taga is a braided bamboo hoop and used to bind cedar staves together. Hoops are made from bamboo and these hoops become loose as time goes on. Such loose hoops can be replaced by iron ones. The irons hoops look red as a result of anticorrosive paint. The iron ones act the same as bamboo ones. It is said that miso was brought from China or the Korean Peninsula, however it is also said that Japan's warm and humid weather created the existing miso at the time. Although miso-like food was found from remains from the Jomon Period, the early authentic literature on miso was released during the Heian Period. This may be because miso was food for the populace and such food hardly became a topic of literature at that time. People had eaten soybeans as seasoning or sources of protein before the Muromachi Period when Miso-shiru (Miso soup) was formed. The Kamakura Period saw miso being grated and miso dishes were created. Miso can be classified by colour and ingredients. There would be 2 types by colour: aka (red)-miso and shiro (white)-miso. Some people divide it into 3 groups such as aka (red)-miso, shiro (white)-miso and naka-miso which means "blend". Soybeans for aka-miso are steamed and beans for shiro-miso were originally boiled but some of them are also steamed. Steamed beans are more nutritious than boiled ones. Another classification is made by ingredients; mame (bean)-miso, kome (rice)-miso and mugi (barley)-miso. Mame-miso has less carbohydrate than other types of miso. Soybeans are used for all types of miso but Koji mould spores are mixed with Aspergillus and the soybeans for mame-miso, with Aspergillus and rice for kome-miso, and with Aspergillus and barley for mugi-miso. Koji is a type of fungus which secretes deigestive enzymes. The aminolysis of soy protein and fat is largely due to the Koji. When the ingredients are mixed with Koji, they are called mame-koji for mame-miso, kome-koji for kome-miso and mugi-koji for mugi-miso. Although the Koji mould spores themselves disappear when they are mixed with water and salt, the digestive enzymes are still alive and the activity of the enzymes is the key point of miso making. Kome-koji is high in salt content. Shinshu-miso (kome-miso)contains 12-18% of salt whereas Hatcho Miso holds 9-12% only. 85% of miso sold throughout the country is kome-miso, mame-miso such as Hatcho Miso is 12%, and mugi-miso is only 3%. Hatcho Miso takes longer to mature than others, contains high protein, has less water content, and is concentrated. However at the same time it contains less salt content and is highly nutririous. Hatcho Miso is classified as mame-miso and mame-miso is usually red, and kome-miso and mugi-miso are white. Even so some kome such as "Sendai Miso" and mugi-miso are also red. The period of fermentation depends on types. Mild shiro-miso takes a week to mature, white kome-miso needs from 1 to 3 months, and red kome-miso needs 3 months to one year though mame-miso ferments through 6 months to 2 years. Some types of kome-miso take more than 7 years at low temperatures. The main element that decides the colour is "Maillard Chemistry". This is a non-enzymatic browning reaction and happens when sugar molecules and aminoacids are heated together. This reaction occurs when soybeans are soaked, boiled or steamed and continues during fermentation. The degree of Maillard Chemistry depends on ingredients and the method of production, but generally the more the reaction happens, the more brown miso becomes. Therefore, mame-miso is usually a dark colour and needs longer time to ferment. Hatcho Miso turns brownish as a result of steamed soybeans. "Akadashi Hatcho Miso" is a combination of Hatcho Miso and shiro-miso. It is soft and milder than Hatcho Miso and its name came from the making process. It originated from Hatcho Miso and Akadashi originally means extracting red from Hatcho Miso. Grate Hatcho Miso and put its soup in a tea towel to squeeze, then mix it with shiro-miso (white one). To be brief, mix red miso with white miso. The best proportion of white and red miso for green vegetable miso soup is 8 to 2 and for shellfish miso soup is 2 to 8. When 5% of Hatcho Miso is mixed with white miso, it is called "Akazashi" and when the proportion is 15%, it is "Akagachi". "Fukusa" is used when Hatcho Miso and white miso are mixed half-and-half. "Tamari" is a fallout of Hatcho Miso. Tamari is the liquid piled up on top of Hatcho Miso during fermentation. It is preferred in the place where mame-miso is eaten. There is a deep relationship between miso and tamari. When it is focused on miso, tamari is not skimmed because strained miso lees cannot be sold and its tamari has less salt content and becomes tasteless even though it is very rich. Thus tamari has a different starting point from miso. Tamari has to be made separately from miso and with a different proportion of ingredients. Very black soy sauce like tamari is purely made by soybeans and salt. Common soy sauce is made also by barley, hence it has a lighter colour. However, it turns brownish when it is not preserved properly. 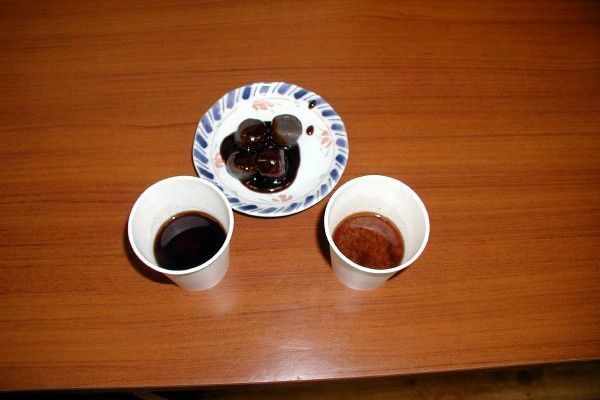 The brown colour of miso and soy sauce is made by a reaction of amylum and protein substance. Weak soy sauce is much stronger than strong soy sauce unlike its look. Cancer prevention: Takeshi Hirayama of the National Cancer Centre Research Institute in Japan in 1981 found that cancer could be prevented by miso. According to his research, people who eat miso soup daily are correlated with 50% lower stomach cancer rates than people who do not eat miso soup at all. He also clarified that the vegetables accompanying miso soup also have cancer prevention effects. In 1992, Akihiro Ito from the Research Institute for Radiation Biology and Medicine (Hiroshima University) also revealed that miso has such effects on mice. Male mice were divided into 2 groups and received neutron radiation. One group of mice was fed normal food as usual and 62% of them got liver cancer although only 13% of another group, which had 10% of miso in their food, got liver cancer. Detoxifying radioactive substance: In Hiroshima, the aftermath of radiation was investigated by some researchers and according to a report, some people who had eaten miso suffered less from radiation disease. Akihiro Ito at Hiroshima University confirmed the effects by using mice. He divided mice into 4 groups and fed normal food, food with 10% of dried red miso, food with 10% of soy sause and food with the same amount of salt as miso to the groups. 3 days later, the mice were examined for the survival rates of their hepatocytes of small inestinal mucous membrane. In the results, the rate of the group which had miso was the highest and moreover some of the damaged cells in the mice which had miso or soy sause reproduced themselves. This is known widely in Europe as well and miso was exported in large amounts in the aftermath of the Chernobyl nuclear accident in 1986. Antiaging: Vitamin E, amino acids, saponin, melanoidin, lipofuscin and so on in miso have antioxidant punch. To remain young and maintain health, it is important to get rid of active oxygen that force substances in the body to be oxidised. Hiromichi Katoh from Otsuma Women's University disclosed how well miso controls active oxygen in 1995. According to his research, active oxygen was greately controlled in both normal and low-sodium miso but low-sodium miso had greater effects. Low-sodium miso such as Hatcho Miso has a more beneficial impact on health. Supporting the research, Tokugawa Ieyasu lived to 75 years old when the average life expectation was 37.8 years old. He tried to maintain his health and had 5 different types of leaf vegetables and 3 kinds of root vegetables in miso soup everyday. Aid digestion: Soy protein itself is poorly assimilated but it transforms itself through enzymes and microorganisms in the fermentation process to be assimilated easily. It also contains active digestive enzymes, which help digestion of other. Detoxifying: Microorganisms in miso discharge putrefactive bacteria and harmful substance from the intestines.